Fashion Bible cover in canvas material with a vintage floral pattern design in peach and aqua; fabric lined interior. Features a front zip pocket, interior pockets, and a pen holder. 10.5" x 8" x 2.5". Fits Bibles up to 9" x 7" x 1.75" hand measured . 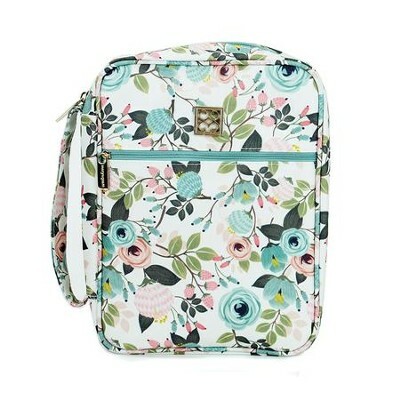 Brilliant Blossoms Collection in watercolor motif. I'm the author/artist and I want to review Bible Cover, Peach Floral, Extra Large.